Artis Gilmore played in the ABA and the NBA. Artis was inducted into the Naismith Memorial Basketball Hall of Fame on August 12, 2011. Gilmore followed 5 All-Star seasons with the Kentucky Colonels of the ABA by becoming the 1st overall pick of the 1976 NBA dispersal draft by the Chicago Bulls. After four All-Star selections in five solid basketball seasons in Chicago, Gilmore was traded to the San Antonio Spurs in 1983. Twice again he was an All-Star in San Antonio. In Gilmore's complete pro basketball career, he was an eleven-time All-Star, the ABA Rookie of the Year, and an ABA MVP, and he remains the NBA career leader for field goal percentage. Nicknamed "The A-Train", the 7' 2" Gilmore once played in 670 consecutive games. 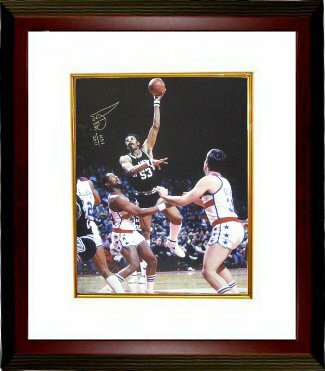 Artis Gilmore has hand autographed this San Antonio Spurs 16x20 Photo with HOF 2011 inscription. Leaf Authentics Hologram and Certificate of Authenticity from Athlon Sports. Custom White Mat and Premium Mahogany Frame as shown.